In this presentation, we highlight information, specifications, and highlights of our new Granite Transmitter. 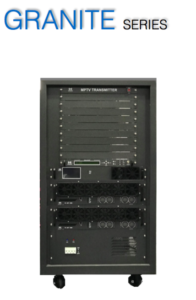 The Granite is an air-cooled UHF transmitter with power ranges from 1 to 10 kW. The Granite features Doherty modulation and amplifier. It offers easy access for maintenance and COTS hardware. The Granite comes with state of industry touch controller and real-time signal quality monitoring. Download a copy of our Anywave Communication Technologies corporate presentation. Read about what we do and all the things we can offer your organization. Learn about our locations and history of our company.